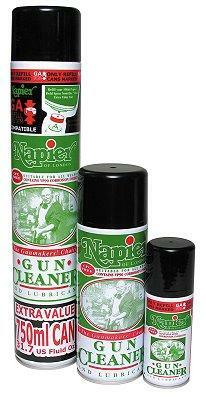 Gun cleaner/lubricant is the modern solution to cleaning all firearms or air guns. Gun cleaner is also an effective lubricant and leaves a fine film of VP90 gun oil on all surfaces, protecting from corrosion through contact and vapour phase inhibitors. Suitable for all types of weapon the power spray action is directable into awkward areas and is economical in use. Available in a 750ML,300ML and 100ML directable spray can.